In House Social Media Marketing Training UK Wide & in London, Birmingham, Manchester and Cardiff. My Social Media Training will help you make social media work for your business. From building a strategy to what to post and how to analyse results, this training will help you to find new clients, provide support and interact positively with existing and potential customers. 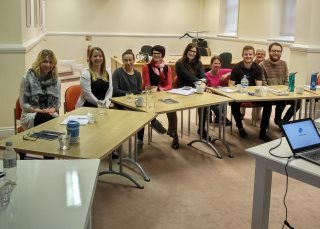 The training can be 1-2-1 or presented to small groups and will focus on selecting the right social media for your business, generating content for these services and analysing the results so you know what works and more importantly what doesn’t. This training also includes an in-depth look at using Social Media Management Software that can help you look after multiple social media networks from one place. It’s impossible to update them all so together we’ll look at your business and decide which platforms are important. The do’s and don’t of profile building. We’ll look at your existing profile and see where changes can be made. Create a solid strategy for the voice of your brand. Never be stuck for ideas & learn how to keep on top of your content through planning. Find out how to write great engaging content. Learn copywriting tips and how to research hashtags. A section devoted to advanced social media listening. What are people saying about you & your competitors. An in depth look at how to save lots of time managing your social media in one place. How to schedule, what to schedule and more importantly, what not to schedule! Make sure you don’t miss questions & queries about your brand or products. Together we’ll set up a customer service monitoring area using Hootsuite. We can work together to create a social media policy for your business. Learn how to respond to positive and negative comments about your brand or products. Discover ways to increase your followers & engage influencers. Learn about the pitfalls and mistakes that can be made using social media.